“Everyone in the community knew that I was the next [to get pregnant], but I was so determined that until I achieve my dream of becoming an accountant, I will not drop out of school, and I will not get pregnant,” said Rebecca Acio, a 19-year-old Ambassador for the Strengthening Accountability in Girls Education (SAGE) DREAMS Project, Uganda. She spoke at a recent Wilson Center event on emerging lessons from the DREAMS Innovation Challenge. As a peer educator at her school in Lira, Uganda, and a temporary dropout herself, Acio “knew what it cost to be a dropout” and worked to identify other at-risk girls to encourage them to stay in school. The DREAMS Innovation Challenge (DREAMS-IC) was designed to complement the mission of DREAMS, a global public-private partnership led by the U.S. President’s Emergency Plan for AIDS Relief (PEPFAR), that is committed to reducing new HIV infections among adolescent girls and young women in 15 sub-Saharan African countries. The Innovation Challenge funded 55 finalists from more than 800 innovative ideas with two-year grants ranging from 100,000 to 10 million dollars to reduce HIV infections among adolescent girls in sub-Saharan Africa. “Research has shown that the longer we keep the girls in school, the more they are empowered with the information, skills, and experiences that help them to make informed decisions about their lives,” said Rita Lulua, Project Director for SAGE-DREAMS Project, Uganda, and a beneficiary of the Innovation Challenge. Because only 36 percent of girls complete secondary school in Uganda, the SAGE-DREAMS project aims to increase the share of girls ages 13–19 who stay in secondary school as a way to reduce the onset of new HIV infections in this population. The SAGE-DREAMS project uses an early warning system in schools to identify adolescent girls who are at risk of dropping out of school. Peer educators use three ABC predictors—A for attendance, B for behavior, and C for course performance—to evaluate risk. “We know that adolescents listen to their peers much more than they listen to us. So we work with them. They are co-implementers,” said Lulua. The project addresses the root causes of high school dropout rates, such as financial hardship, the onset of HIV, lack of menstrual hygiene materials, and poor performance in school by providing HIV testing and counseling in school, teaching young women how to make their own sanitary pads, and building community by supporting fellow peers. The early warning system has been highly successful at keeping girls in school across 10 districts in Uganda, with a success rate between 94 and 99 percent, said Lulua. More than 26 percent of young people ages 15–24 are unemployed in Kenya, home to the fourth largest epidemic of HIV in the world, alongside Mozambique and Uganda. The African Centre for Women, Information and Communications Technology (ACWICT), based in Nairobi, Kenya and a beneficiary of the DREAMS-IC, provides vocational and life skills training for young women to help them achieve financial independence, which in turn decreases their risk for contracting HIV. “Besides being trained in motor vehicle mechanics, I was also taught life skills and communication skills in school,” said Sheila Omolo, a 21-year-old who is now a mechanic. The Centre provides a skills-based training for three months with an internship to prepare young women to become eligible for employment. The program weaves public health promotion into the curriculum by teaching adolescent girls about how to prevent and test for HIV, and counsels them on HIV incidence and transmission. 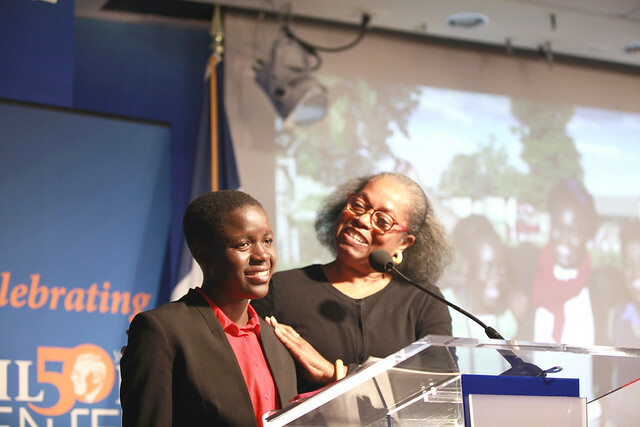 Being paid to work helped Omolo meet not only her needs, but also her mother’s, she said. “And this also prevents me from getting involved in such activities that could risk my life,” said Omolo. Professional library development organizations are focused on developing the capacity of public libraries in Africa to address key issues, said Jane Meyers, Founder and President, Lubuto Library Partners, Zambia and an Innovation Challenge beneficiary. To counter rising HIV infection rates among adolescent girls, Lubuto Library Partners’ creative solution involved proposing the public library as a platform, “as a gateway to a suite of services and programs that we knew could make a difference in girls’ lives,” said Meyers. As a public library, Lubuto Library maintains a vast collection of resources, programs and outreach, and confidential access to a wide range of high-quality resources on sexual and reproductive health. Libraries always partner with community institutions, and they know how to create programs that meet needs that they identify in the community, said Meyers. Lubuto Library offers mentoring programs to help girls “understand what they can do in the world and to be guided and lead and inspired by leaders,” said Meyers. To promote the health and wellbeing of adolescent girls, the library offers sexual and reproductive health programming, a family literacy program to help young mothers develop foundational skills, and even on-site HIV testing. The young women come get their HIV tests right outside the library doors, said Meyers. DREAMS’s vision is to “ensure that every adolescent girl and young woman can grow up to be determined, resilient, empowered, AIDS-free, mentored, and safe,” said Angeli Achekar, Principal Deputy Coordinator for the Office of the Global AIDS Coordinator and Health Diplomacy at the U.S. Department of State. The DREAMS-IC winners will continue to establish mechanisms to ensure interventions are sustainable and long lasting, even when funding ends, by prioritizing local adaptation. Project Director, DREAMS Innovation Challenge Program, JSI Research & Training Institute, Inc.
Senior Program Manager, East Africa, DREAMS Innovation Challenge Funds Manager, JSI Research & Training Institute, Inc.